Kuriyama's new Metal-Hose-To-Go™ Program features Hose Tec® Brand ready-to-use metal hose assemblies with SS304 Schedule 40 TOE (Thread-one-end) fittings pre-welded on each end. 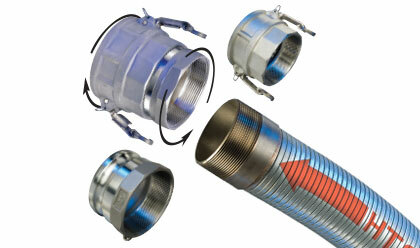 Readily accepts our Kuriyama-Couplings™ standard Quick-Acting Camlock Couplings and Adapters. Our new Threaded Swivel Couplers and Adapters make hose handling easier and extend hose life by reducing torque pressure. Click here for more info.